Jermaine Beckford scored an impressive solo goal to give 10-man Everton victory over lacklustre Chelsea. The striker broke clear near halfway before coolly chipping over goalkeeper Petr Cech in the 74th minute. Everton had to play most of the second half with 10 men after Seamus Coleman was shown a second yellow card for a reckless challenge on Jon Mikel Obi. Shortly after the match, Chelsea issued a statement announcing they had parted company with manager Carlo Ancelotti. This match represented a sad farewell for the likeable Italian, because his players signed off the season with a whimper. Denied the services of Didier Drogba, who was out with a groin injury, the Italian fielded Nicolas Anelka and Fernando Torres in attack. The duo failed to gel and, as so often since his January move from Liverpool, Torres was virtually anonymous. Chelsea finished the season in second place, but their points total of 71 was their lowest since Roman Abramovich took over the club in 2003. And despite landing the Double last year, in his first season at the club, the signs looked ominous for Ancelotti after he failed to add to that trophy haul. By contrast, Everton will be reasonably satisfied with their seventh-place finish - the fifth successive season in which they have come in the top eight. If they are able to strengthen in the summer and hang on to the likes of Jack Rodwell, Leighton Baines and Tim Cahill, they could conceivably challenge for the top four next season. There was a distinct end of season feel about a first half in which both keepers were virtually redundant. Phil Jagielka had the best chance of the half for Everton, clipping the top of Chelsea's crossbar with a close-range header from a Mikel Arteta corner. And the home side thought they had a good claim for a penalty shortly afterwards, when Leon Osman burst into the box and was brought down by Alex, but referee Peter Walton adjudged the burly Brazilian to have touched the ball. Everton passed the ball nicely, with Rodwell showing some good touches in midfield and Baines providing an attacking thrust from left-back. But a lack of cutting edge has been their Achilles heel all season and with leading scorer Louis Saha out because of a foot injury, Beckford was left to lead the line as a lone striker. The former Leeds man has struggled to convince since his move to Goodison Park and so it was again at the end of the first half, when he found himself one on one with Cech and succeeded only in putting the ball out for a throw-in. 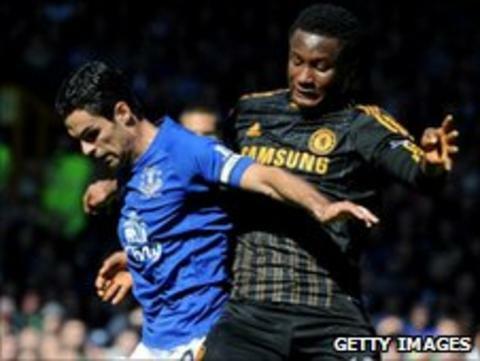 Everton's task became distinctly more difficult eight minutes after the interval, when Coleman was shown a second yellow card for a studs-up challenge on Mikel. The 22-year-old, who had been booked at the end of the first period for a late challenge on Ashley Cole, could actually have been shown a straight red for his dangerous lunge at Mikel's right ankle. The young midfielder has enjoyed an excellent season for Everton, being named the club's young player of the year, but this was a sour end to his campaign. Chelsea controlled possession after his exit and captain John Terry rattled the post with a rasping 20-yard drive, but it was Everton who took an unexpected lead through Beckford. The striker atoned for his earlier miss by keeping his composure to hit his 10th goal of the campaign. He capitalised on a lucky ricochet near the halfway line and used his pace to break clear of the Chelsea defence before coolly chipping over the onrushing Cech. Chelsea dominated after that, yet surprisingly failed to really test Tim Howard in the Everton goal. It was a limp end to a disappointing season, and Ancelotti paid the price.